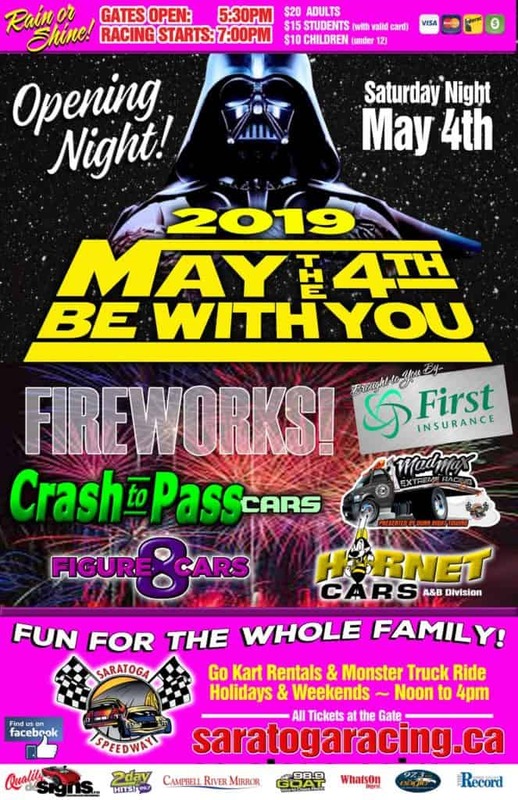 The biggest crowd of the season Saturday night at Saratoga Speedway saw a full size Limo jump, a hard hitting Crash to Pass boat race along with 15 car races and the first ever speedway marriage proposal. Josh Beckell aka The Crusher performed his 2nd car jump of the season by jumping a full size Limo into a stack of cars it was first time in his 9 years of car jumping he jumped a Limo. The 2nd feature of the night was the seasons last Crash to Pass boat race which featured a hard crash on the first lap knocking out two of the 11 cars and after all the boats were destroyed current Crash to Pass point leader Mike Jenkins ended up the winner by having the most boat remaining which ended up as 5 feet of fiber class. The Marine Harvest sponsored night of racing which also featured Crash to Pass, Road Runner, Hornet and Mad Max racing began with the first ever marriage proposal before the national anthem and she said yes. In Crash to Pass racing Chris Campbell picked up the heat race win while defending point champion Sheldon Hopp returned for the first time in 2017 and he collected the main event win in Cam Edwards car which was later involved in the first lap hard crash in the boat race. In Road Runner racing defending point champion Ryan Guest continued his 2nd half of season push as he took a clean sweep of the nights races and in doing so improved his overall point lead to 48 points in the season points race. In Mad Max racing Dannielle Antonik the current point leader improved her point total by winning the heat while Brad Dimitrov won his first main event of the season in his 4th different car. A full field of Hornet cars were on hand with race wins in the B class going to Josh Taks, Daniel Morrissey, Stephanie Addison and James Laidlaw in the heat races while main event wins went to Kyle Leouzio in the B and Addison in the A. In Hornet A racing heat race wins went to Darren Monk and Nigel Neufeld in his 3rd different car this season while the A main had a last lap pass for the win for Micheal White who passed sister Ashley for the win. Next up for the Black Creek oval this Saturday night is the seasons last visit by the Wilroc Sprint cars along with the IMCA Modifiedes and the Dwarf cars. Wednesday night practice’s return this Wednesday night and will be held every week until the end of the season.